New River Kinematics and FARO Technologies share a common goal–delivering solutions to customers. This isn’t accomplished with a one-size-fits-all approach, but by finding the right solution that solves problems and meets the unique needs and requirements of each customer. 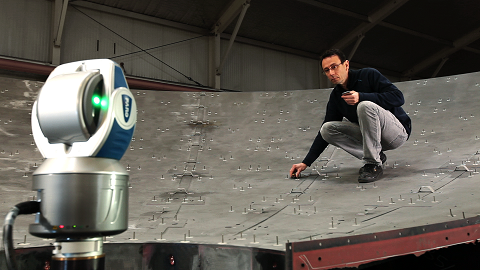 When the answer calls for FARO and SpatialAnalyzer (SA), the combination offers the customer a powerful solution. The FARO Laser Tracker Vantage offers users large volume 3D measurement that is portable, highly accurate, and durable enough to withstand the rigors of the shop floor. SA is a versatile, robust software package that interfaces with virtually any number and type of portable metrology device. The partnership between hardware and software delivers an even greater value to customers, helping them achieve goals, save time, and improve efficiencies. The software essentially unlocks the power of the tracker and allows users to interact with the hardware. With SA, users are able to visualize the measurement process, analyze data, make decisions, report findings, and repeat processes. In today’s economic climate, customers are seeking comprehensive solutions that can not only accomplish goals, but deliver a return on their investment in hardware and software. SA’s capabilities like Relationship Fitting, GD&T, and Automation with the use of Measurement Plans are saving manufacturers significant amounts of time, resources, and money. Automation in particular is becoming increasingly more important as automated processes become more of the rule as opposed to the exception in the manufacturing world. Return on investment can be found as a result of saving time (in some cases, reducing a measurement process from days to a matter of hours), reducing scrap, avoiding costly rework, and obtaining accurate, reliable measurement data. Simply put, the combination of SA and the FARO Laser Tracker Vantage benefits customers by helping them achieve goals and improve productivity through accurate and advanced measurement processes.